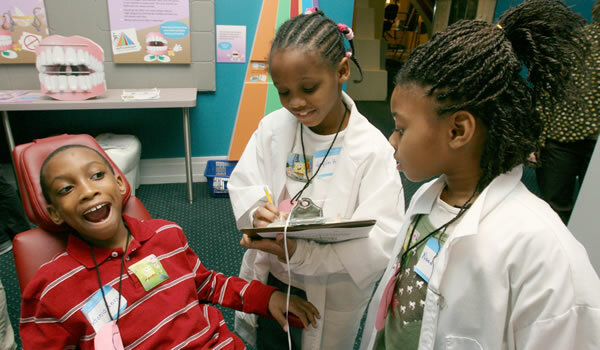 The efficiency of a school-based dental sealant program depends upon preparations made before the dental equipment is delivered to the school. Programs make a variety of arrangements for transporting equipment. In some cases, staff use their own personal vehicles. When the program is sponsored by an agency (e.g., city, county, or state health department or community health center), staff or school personnel might use agency-owned vans. Equipment and supplies need to be well organized so they can be unpacked and transformed into dental operatories quickly. In programs with two or more dental hygienist and assistant teams, dental assistants may have their own supplies and equipment that they are responsible for maintaining. Storage containers should have labels identifying their contents and the team to which they belong so the supplies and equipment can be easily sorted on the day the equipment is delivered. Either on the day before the program is scheduled to begin, or early in the morning on the same day, dental equipment should be delivered to the school and placed in the area where the program will operate. All equipment setup and breakdown, sterilization, instrument-tray preparation, and paperwork should occur before or after school. The setup process involves creating dental treatment areas and a sterilization area, if disposable instruments are not used. Before the dental operatories are erected, program staff locate the electrical outlets and determine where each operatory will be placed. Supplies around dental operatories are placed within reach. Storage containers for transporting supplies can double as tables. A large trash can, if lined with plastic, can be used to transport supplies and then later can be used as the trash receptacle. Tray tables can be set up on either side of dental operatories, so that the operator uses one table to hold a laptop computer or tablet or student records, parent notes, and referral forms (which the operator completes after applying dental sealants for each student), and the dental assistant uses one table to hold extra disposable supplies and sealant materials. Containers placed behind the dental assistant can hold prepared instrument trays, hand wipes, toothbrushes, foil wraps for dental lights, sunglasses for eye protection, and extra supplies that may be needed as the day progresses. A storage container beside the dental hygienist can hold gloves, masks, and antibacterial wipes. If reusable instruments are used, a dishpan placed under the tray table next to the dental assistant can be used as a receptacle for contaminated instruments that were used to place dental sealants. If reusable instruments are used, the sterilization area should be set up near the treatment area. It is important to identify and maintain a clean side and a dirty side within the sterilization area. Equipment and supplies normally include a sterilizer, an ultrasonic cleaner, containers with rinse water, sterilizer bags, paper towels, and gloves. Extra supplies needed for sterilization may be stored under the sterilization table or in another convenient, clean location. If disposable equipment is used, this additional space is not needed. Another area should be reserved for extra supplies, backup equipment, and empty bags and containers. This area should be easily accessible so the supplies and equipment can be retrieved as needed. While preparing the operatories, one member of the school-based dental sealant program team can check to see if any signed parental consent forms were returned to the school since the forms were collected. The student health histories also need to be reviewed, if necessary, and, for students who do not have records, student records need to be prepared or keyed into the school-based dental sealant program database.